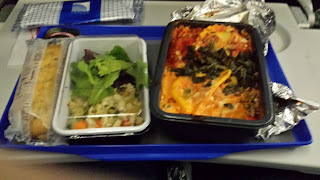 This is what I was served in economy plus on my trip on United from Dulles to Brussels. I don't think it had any flavor, and the presentation wasn't very good. Yes, I know it's an airplane, but we deserve better! I was very impressed with Air Namibia's food. It was a hot meal on a two hour flight and tasted delicious. I wish every airline worked as well as them.